If you have a CCJ on your credit record, this could be disastrous if it’s not removed. A CCJ is a County Court Judgment. Not only will it stop you obtaining credit, including a mortage, it may also hinder your career. Many employers carry out a credit check to find out whether a prospective employee is suitable! If you don’t do anything about it, the CCJ will stay on your credit record for six years! So, what do you need to do about it? How can you get it removed? 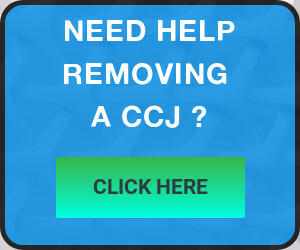 If you pay the CCJ within one month, it will be automatically removed from your credit record. You may decide that this is the most expedient option, particularly if it’s only a small sum of money. However, if it’s a larger amount of money and you don’t accept that you owe it, you may feel that paying it is unreasonable. Please note that paying it more than a month after the date of the CCJ will not mean that it’s removed from your credit record. The credit record will however be updated to say that the CCJ has been satisfied. This is of course better than having an unsatisfied CCJ on your credit record but it will still stay on your record for 6 years. If you’ve only just discovered the CCJ and it was entered a long time ago, you may be happy to sit back and wait until the six year period has expired. It will then be removed from your record and will no longer affect you. Obviously, this option is less attractive if it is a recent judgment. The court has a discretion to set aside a CCJ in certain circumstances. If you can show that you have a real prospect of successfully defending the claim, the court will set aside the judgment. you didn’t know what you were supposed to do when you received the court papers. For more information about applying to have a CCJ set side, have a look at this blog post and be sure to act promptly! Previous Entry: How Much Money Should You Get in a Settlement Agreement? Next Entry: Is Getting a CCJ Set Aside the Same As Getting it Removed?